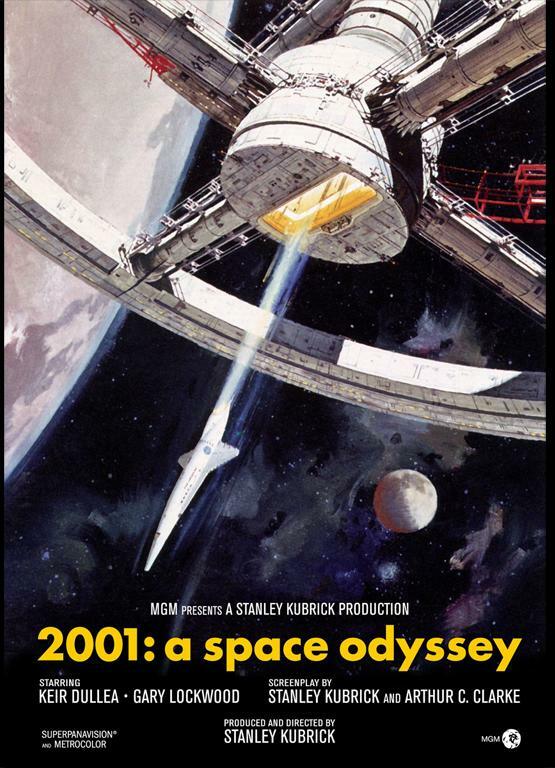 The boyfriend and I re-watched '2001: A Space Odyssey' the other day. After fast-forwarding through the first 20 minutes of ape fights, I really enjoyed it. It's such a neat-looking movie. If you've seen '2001' (and if you're nerdy enough to read this blog, I'm guessing you have) then you will recall the first scene set on the Jupiter-bound spaceship. The camera follows Dave as he runs laps through the ship's centrifuge. 1969 called, it wants those shorts back. That scene got me thinking: wouldn't it be great if there was a gravity-simulating centrifuge on the International Space Station? The half dozen astronauts and cosmonauts living on the ISS could certainly use one. Living in microgravity, they suffer through rigorous, hours-long daily workouts in an effort to stave off the negative effects of microgravity on the body. And my understanding is that even with extreme workouts, you still loose lots of bone and muscle mass by the time you return to Earth. 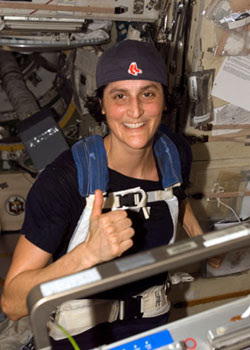 Astronaut Suni Williams running the Boston Marathon aboard the ISS. 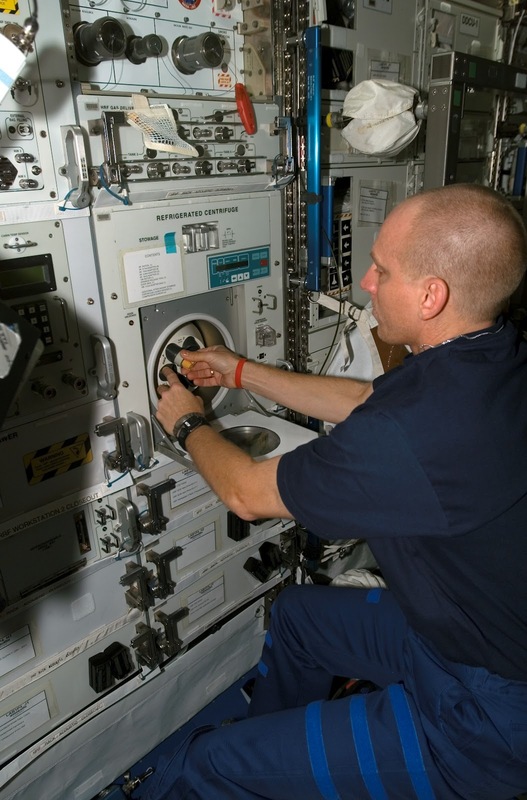 There is actually a centrifuge aboard the ISS, and there's an interesting history behind it. The tiny, refrigerated centrifuge doesn't hold anything bigger than a test tube, and it seems to be used more for separating liquid samples than for any actual gravity experiments. 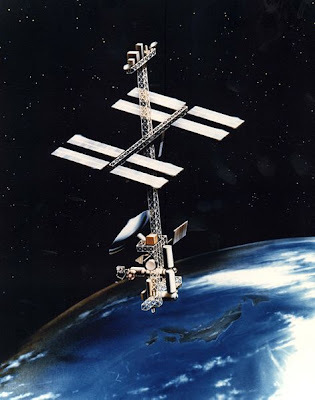 But initially, when planning for the ISS first began, folks anticipated building a centrifuge big enough to actually hold people. The centrifuge would have dramatically increased the station's power needs, so a tower of Russian solar panels would have been added to boost power output. This plan was quickly scaled down because of funding and engineering concerns. An early design, featuring a solar "power tower." The person-sized centrifuge design was replaced with the Japanese-designed Centrifuge Accommodations Module. This would have held an eight foot in diameter centrifuge. It would have been attached to the rest of the station on special vibration-absorbing mounts designed to damp out the effect of the rotation on the rest of the ISS. While an eight foot centrifuge wouldn't be big enough to hold an astronaut, it could have generated up to two times Earth gravity for plants and animals less than two feet tall. This would have been an exciting development- we could have made real progress in learning to combat the negative effects of life in microgravity. And we would have learned how animals from Earth would adapt to survive long-term on a lower gravity planet. The 8 foot wide centrifuge. 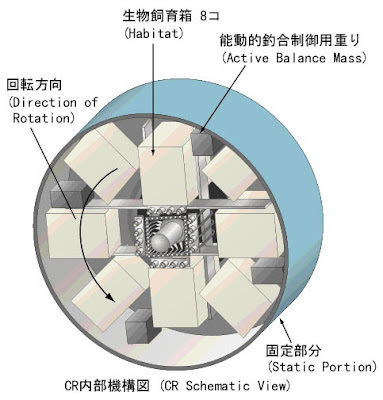 But, plans for this medium-sized centrifuge were scrapped years ago. 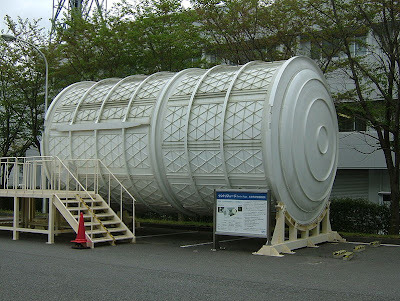 The partially constructed Centrifuge Accommodations Module sits in a parking lot outside the Tsukuba Space Center, just north of Toyko. You can visit it! Which is neat, but not as neat as if it was installed on the International Space Station. Source: NBC News; NASA; Wikipdedia; Quora; Space.com.